As going into the last weekend of games in April, the weather is heating up and making for some great football. Spring Valley sits atop of the Northern Division going into this matchup and with 7 consecutive victories in a row. Favorites to make the playoffs come May, they will play against Manhattan Celtic in Willow Grove, New York at the North Rockland Soccer Complex on Sunday, April 29th. “We are happy to have beaten NYPD and get off a losing run of two games. To be fair, we played very well against CPR Reds and we're unlucky not to tie the game.” said Coach Matthew Kane of Manhattan Celtic. An exciting encounter for the league, Celtic expect nothing but a good performance. “It's pretty much continue with the same path and look to be expansive and brave when we play Spring Valley.” Added Kane. Club Deportivo Iberia have a point to prove with a win against Williamsburg at Randall’s Island this Saturday, hoping to get a few wins in the bag to secure a better overall table position come the end of the season. A upper-half table finish would be an improvement for the Galician side as they haven’t reached a 4th or higher place finish since their stellar 2013/14 season, winning the League Cup and made it to D2 Playoffs. Currently, they sit in 5th in the Southern Division and are looking to make strides this season. Williamsburg International, right above Iberia in 4th, are 9 points away from top spot. A runs of wins would be the ideal scenario for last season’s Metro Division 1 Champions. “While we always want to win, the expectation at the club was to show we could compete at this level. Given our results so far, I think we have been able to do that.” Williamsburg Inter. Secretary Charles von Rosenburg told the Cosmo League. “The biggest difference at this level is the consistency in quality across all teams in the division. Some are better than others but there are no easy matches. If you let up even for a few moments, teams are equipped to take advantage.” von Rosenburg added. Kickoff for Club Deportivo Iberia vs. Williamsburg International is at 8:00pm at Randall’s Island Field 74, New York this Saturday, April 28. Last time these two met, Stal Mielec came home with the bragging rights, a contested 1-0 win. Now it’s 2nd versus 3rd at the Bushwich Inlet Ground: Stal Mielec NY haven’t lost a match in 7 league games. Polonia Gwardia have the best defense in the league and have only lost a single match. A push for a final table position sees the gap between Northern 3rd place Malatyaspor USA against 8th place Sporting South Bronx close on Sunday. Newcomers Malatyaspor are experience a dream debut season in the Cosmo League, in 3rd place in the North having 8 wins, 1 draw and 4 losses with the best goal advantage: 52 goals scored and 29 allowed for a total of 23. 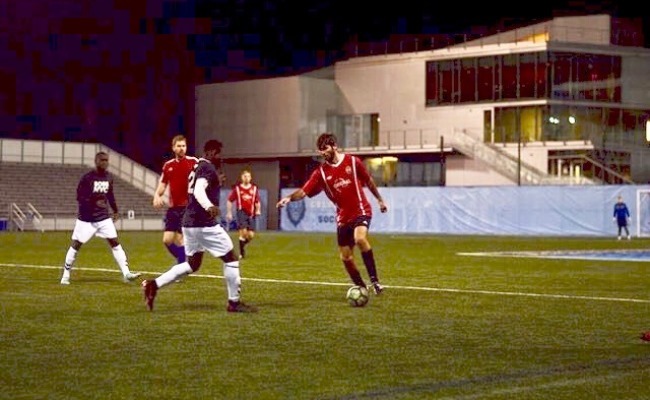 Team Sporting South Bronx, formerly known as Sporting Astoria SC (club now rebranded as Sporting Soccer Club), have only collected 9 points in 12 matches with a record of 3 wins and 9 losses.